There are various types of wheelchairs on the market and if you are currently a manual wheelchair user, you will probably know some of the things you need to take into account before choosing one. If you are a new user, you should spend some time comparing and trying different models in order to choose the right one to suit your needs. 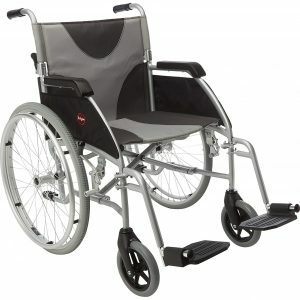 There are various special function wheelchairs for complex needs. Lightweight aluminium wheelchairs can offer a combination of safety and durability with customisable features such as armrests and footrests . They also have self-propelled and attendant-assisted versions that can be quickly demounted in order to transport easily. Folding transit wheelchairs help where a person can be pushed by an attendant, a lightweight folding wheelchair is practical and transportable. Options include quick release wheels (on self propel version), detachable armrests, swing in-out footrests, puncture proof tyres, lap belt, folding backrest, lightweight padded upholstery etc. H&M have a vast range of wheelchairs and accessories both instore and available through our selective range of quality suppliers. Our highly trained friendly team are here to help you choose the right product to meet your needs. A small selection of our product range is shown on this website.